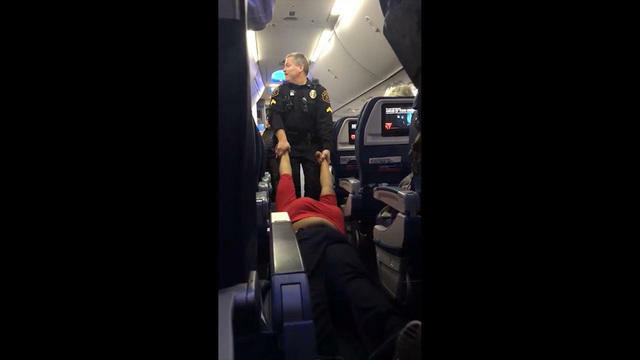 DETROIT -- An incident on a Delta flight in Detroit was caught on camera Monday, as a woman was dragged down the aisle of the plane by police. Detroit Metropolitan Airport said in a statement that the incident occurred at approximately 8 a.m.
“Delta Air Lines contacted Detroit Metropolitan Airport’s police department requesting assistance with a passenger who would not comply with boarding and baggage check procedures at a McNamara Terminal gate,” DTW said in a statement. When officers arrived, Delta stated the woman could not remain on board. Despite repeated requests by officers, the woman refused to leave the aircraft and had to be removed. The flight was able to continue without further incident. The nonstop flight arrived at San Diego at 10:38 a.m. PST, according to the airline, CBS Detroit reported.